Cycle routes Emilia Romagna are an integral part of this region, in the north of Italy. In fact, thanks to a predominant flat landscape, the bicycle becomes the ideal way to move comfortably. Emilia Romagna is the first Italian region for the spread of cycle paths. This region is able to offer various holiday opportunities to cycle-tourists with its 8000 kilometers of itineraries. Cycle paths that border the sea, go up the Apennines, cross villages and cities of art. Also of great scenic interest is the cycle path along the banks of the river Po up to the Delta and its mouth. Thanks to the parks and the nature reserves of Emilia Romagna, bicycle enthusiasts can enjoy unique experiences. From the plain to the Apennines, parks and reserves protect the Apennine valleys and the rivers that run through them. As well as the wetlands so valuable for the ecosystem. Hence the cycle routes within these places give the opportunity to discover beautiful landscapes. And also the nature, the environment, the history and the architecture of breathtaking beauties. The “Ciclovie dei Parchi” is a project of the Emilia Romagna Region to promote the nature conservation. As well as the enhancement of the entire regional system of the protected areas. It is a project born with the “Alta Via dei Parchi“, an extraordinary itinerary to be covered on foot along the Apennines. In the detail, between the regions of Emilia Romagna, Tuscany and the Marches. The “Ciclovie dei Parchi” are 10 cycle routes between the Via Emilia and the Apennines. Rather heterogeneous, each of them is passable in one or half day. The Emilia Romagna website ER Ambiente has a comprehensive description of all the itineraries of this wonderful project. Ferrara and its province offer a completely different landscape from the “Ciclovie dei Parchi”. A landscape between water and earth with no end. Where the bicycle becomes the perfect tool to discover the vast plains and a lush countryside. As well as the places of art beloved by the Este lords in the Middle Ages, where Ferrara becomes the cradle of the Italian Renaissance. And today the UNESCO recognizes this city and the Po Delta as a World Heritage Site. One of the routes for your bike ride is the Destra Po. It is a path that accompanies the river Po in its last 100 kilometers to the Adriatic Sea. As a result, it starts in Stellata and ends in Gorino immersing you in the Po Delta, for a total of almost 120 km. It is one of the longest bike paths in Europe and is recommended in spring and autumn. But the territory of Ferrara offers more than 20 routes that you can choose for your bike rides. 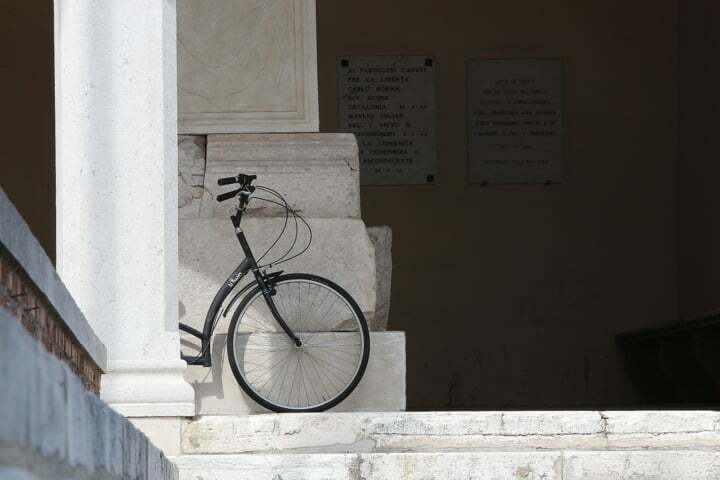 The art cities of Emilia Romagna offer itineraries of considerable interest to the cyclist. Surely, being in a flat landscape, they allow everyone to move without great effort. One of the most interesting tools to discover the beauties of this region is the Bike Map. Conceived by the province of Ferrara, it has been extended to the art cities of Piacenza, Parma, Modena, Bologna, Faenza, and Forlì. The tourist information office of each city can satisfy every request by delivering well detailed itineraries.